Breechblock markings are made by the impact of the shell head against the breechblock by the force of the explosion in the cartridge. Inasmuch as these nearly instantaneous pressures amount to a few thousands of pounds per square inch up to as much as 65,000 pounds per square inch (in the case of some rifle ammunition), and since the pressure is exerted equally in all directions, it is obvious that the shell case (at the moment that the bullet leaves it) will strike or be pushed back against the breechblock with considerable force. When the head space is large and the shell head does not lie directly against the breechblock, the shell may acquire a considerable momentum before it strikes the breechblock, and the markings will consequently be more distinct. Soft, uncoated primers give the best impressions. Often several matchings can be found on the same pair of shells (Figs. 24, 25). It frequently happens that the markings are so well defined and so distinctive that simple enlarged photographs, taken under proper illumination, are sufficient to show that the evidence shell and test shell must have been fired in the same gun. Fig. 26 is a reproduction of Goddard's photographs of the evidence and test shell in the celebrated Sacco Vanzetti case. The extraordinary similarity of the markings on these shells can lead the experienced firearms examiner to but one conclusion. The comparison microscope was not used in this case as Goddard, the only person using the instrument at that time, was not called into the case until later when the findings were being reviewed by the Governor. Figs. 27, 28, and 29, taken from the author's files, show such an obviously repetitive character of distinctive markings that comparison microscope (or comparison camera) photographs are scarcely necessary. Enlarged photographs (usually 8X10 inches) are better understood by the members of the average jury, to whom a comparison microscope may appear to be a very complicated instrument. In .22 cal. rim fire ammunition the pressure is ordinarily insufficient to produce Breechblock marks of any value, but occasionally repetitive markings are produced (Fig. 30) and, of course, they should always be searched for. Firing pin impressions, however, can be matched more frequently. The characteristics of the markings made by the Breechblock depend on the processes of manufacture, the particularities or peculiarities of construction, and on what happens to the face of the Breechblock subsequent to manufacture. Fortunately for the examiner the possibilities for variation are almost infinite. Because each manufacturer has a certain procedure for the production of a certain model of arm, which may differ from that used by some or all other manufacturers, and because he follows this procedure fairly consistently, possibly in his different models, it should be possible to classify Breechblock faces according to the special characteristics they possess, i.e., certain patterns may be established. Such a classification was attempted by Mezger, Hees, and Hasslacher in Germany and a summary of their findings was published in the Archiv für Kriminologie, Vol. 89, pp. 1-32 and 93-116, a translation of which appeared in the American Journal of Police Science, Vol. II, pp. 473-499, and Vol. III, pp. 124-145. This work is the most comprehensive of any that has ever been attempted along the line of cartridge classification and identification and is so fundamentally important that we are reproducing the most salient points in Appendix I. While this classification is interesting it has not come into general use, probably for several reasons, such as inaccessibility of the article, lack of understanding of the system, lack of definiteness in prediction, and, perhaps most important of all, the difficulty of recognizing with certainty the markings to be looked for. Some firearms examiners go as far as to say that any attempt to narrow down the search in such a manner is useless and might even result in missing entirely the gun wanted. And they feel the same way about classifications relating to rifling markings-although here they would recognize that a bullet having, say, four grooves and left hand twist must have been fired from a gun having four lands with left hand twist, and they would so advise those whose duty it is to make the search. Some examiners take the position that a wise detective will collect everything that might conceivably have anything whatsoever to do with the case and that it is best not to tell him too definitely what he should look for because, in doing so, something not included in specific instructions and information given to him might possibly be overlooked. The author does not subscribe to this point of view because he believes that it underrates the intelligence of the detective, who is entitled to all possible aid. 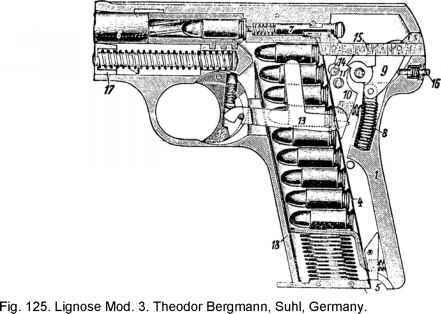 In center fire cartridges the distinctness of the breechblock impression depends not only on the thickness of the primer, the composition of the primer, the strength of the powder charge, and whether the primer is properly seated, but also on the presence of oil, grease, dirt, or rust on the breech face. It also depends on the amount of head space. Factory stampings often interfere with the making of good impressions on the head of the shell. Formerly, manufacturer's identifying marks (usually a single letter) were placed on primers, but, fortunately, this practice has been largely discontinued if not completely so. What are breech block markings? How are breechblock marks produced? How is breechblock marks made? Where can breech block markings be found? Is breechblock markings impression or striation?